I really had fun writing these three books, and I would love you to join in that experience! If you like history, the supernatural, a good romance, adventure, travel and a good dose of reality, I am confident you will love these books. A young man is trapped working for an illicit operation. On the other side of the world a young woman endures another kind of slavery. Somehow the two are destined to cross paths, but not necessarily at the same time. In the struggle to find meaning, they are drawn into exotic places, adventures, situations and relationships, all of which appear unrelated. Or are they? Several plots are interwoven in this dramatic, tense and mysterious, yet at times humorous, voyage across decades from youth to adult, through the hero’s journey towards a destiny which includes romance and spiritual soul-mates. It is a surprising journey; one that will have you wanting to read the other books in this uplifting trilogy. It’s been decades since Bion’s last mission with the Red Key, but a Russian mafia chief still holds a grudge against him. His new lover, Freya, is shaken when she meets a handsome young fighter pilot with an amazing history. Will confronting the tensions from both of these challenges pull them apart, or take them to new highs? Zooming from obligation to freedom, this second book of the Bion & Freya Trilogy addresses the core of war and peace… in adventures full of action, suspense, humour, drama, and supernatural romance. This novel has storylines based on real life history, exciting as they are enigmatic. All the entwined plots are unique, confronting dilemmas relevant to everyone today. An adventure that is full of action, suspense, humour and drama, this book will delight and entertain everyone. The main characters tackle everyday issues; spirituality, family, habits, ethics and romance that affect us all. 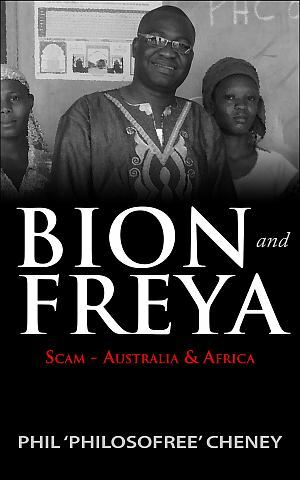 The third novel is based on the actual experiences of the author in Ghana, where I lost a lot of money in a scam. The trilogy travels the world, and outside the world, fiction and fact mixed. Lanoe woke with a start. He was flying again, but where was his plane? He was ascending, and looking down could see the familiarity of the trenches, a crashed plane, people milling around, but they didn’t look up at him. It was quite beautiful. The sun, shining down, he could hear a lark singing nearby, the trees in a forest below waved their ancient heads, and he became smaller, and faster, till he was a blur of memories, spinning around his head, memories and thoughts and more memories, piling up like a gigantic library of books that he could read simultaneously. Then silence. The memories opened like lotus flowers and Lanoe’s spirit sucked the nectar from each one. His first kiss. The fight with his father. Flying that first time in a Farnham. His death. Each memory was gentle. Surprisingly even the ones he had thought were pain or suffering at the time. They were all gentle and sweet recollections. Some had jolted him towards an awareness of his true nature, others had been times when he had loved, when he had been that true nature. He discovered he loved himself, always had. And then he discovered why. You can purchase the books from amazon in either hard copy or ebook format.